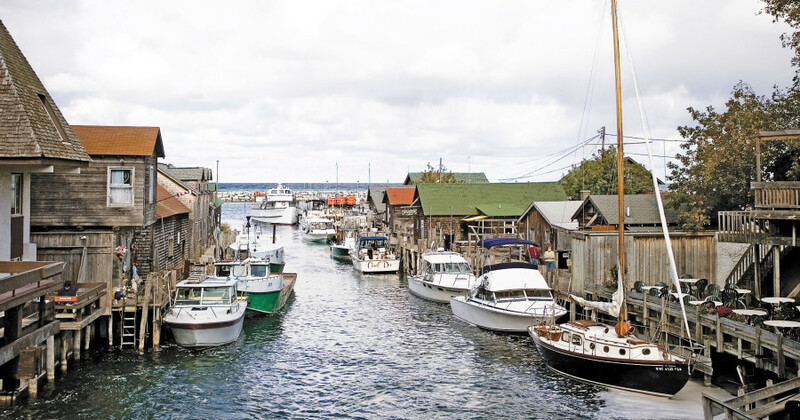 Just a short drive northwest of Traverse City, the quaint Leelanau County town of Leland is a hotbed of eateries, historic fishing shanties and shops. And come Memorial Day Weekend, this lakeside town will be abuzz with sun-soaking, Fishtown fun. Check out these travel ideas to make your Memorial Day weekend in Leland legendary. Enjoy the elegance of yesteryear at the historic Riverside Inn and Restaurant in Leland. Situated directly on the banks of the Leland River, the Riverside offers amazing views from their outdoor deck and a creative menu that showcases local produce. We love the Michigan asparagus salad, crispy gnocchi, and local whitefish. Be sure to take the family to Sunday brunch from 10 a.m. to 2 p.m. Should you want to spend the night in Leland, the Riverside offers charmingly vintage accommodations, all renovated with modern comforts. Check in at the Leland Lodge for a weekend stay at a perfect base for Leelanau County exploration. Set amid pines in a quiet and pretty Leland neighborhood, the Lodge offers instant access to a weekend outdoors. Cyclists should know that some of America’s best road-riding terrain starts right outside the door—spin among orchards, vineyards and along lakeshores on remarkably car-free roads (we love these 10 Leelanau bike routes). If the links are more your style, the Leland Country Club, adjacent to the lodge, can be used by non-members based on its availability. Historic Fishtown and shopping are a short stroll away. After enjoying Leelanau’s terrain, treat yourself to a true Up North dinner at Bogey’s 19th Hole Bar & Grill. Go classic Michigan with Whitefish Your Way—broiled, beer-battered or pan-seared. Red meat fans will also find plenty to satisfy. After dinner, head to the Leland Lodge’s Bogey’s bar for a glass of wine. Sample from an extensive selection of award-winning Leelanau vintages or explore flavors from afar. Benjamin Maier is an incredible local artist who says this: “I understand pottery as being able to unite people together at the table.” This conviction shows through in his work: unique and striking pieces that are either soda (a process in which soda is introduced to the kiln at peak temperatures) or wood-fired. For more than 100 years the Carlson family has been working the Fishtown docks specializing in smoked and fresh local Michigan fish. Little has changed at Carlson’s, so stop in for a glimpse into Leland’s bygone fishing days, as well as delicious eats. Grab some whitefish paté and smoked lake trout and head out to the pier for an impromptu picnic! Not every town is lucky enough to have its own signature brand, but Leland is not just any town. Chrissy Chesterfield has made the iconic tug boats of Leland into the inspiration for the Tug Stuff brand of clothing. Stop in at the Fishtown store—we guarantee that people will recognize the tug in all sorts of places outside of Leland. Leland is famous for its long stretches of uninterrupted beaches. While Lake Michigan may still be a little chilly for swimming over Memorial Day Weekend, there is no better way to spend a few hours than to walk along its shore. Visit Van’s Beach (which has convenient parking located right at the entrance) and take off toward the Whaleback Sand Dune. Be sure and keep an eye out for Leland’s famous blue stones! Ask any Leland native where to get a good sandwich and they will unhesitatingly say “The Cheese Shop.” For more than 25 years, The Village Cheese Shanty, located in Fishtown, has been selling gourmet sandwiches, specialty food products, and award-winning Leelanau County wines and beer. Open every day May through October, The Cheese Shanty is the perfect place to get lunch to-go. The Manitou Island Transit Company offers a variety of ways for visitors to get out on Lake Michigan and experience the wild beauty of the Manitou Islands firsthand. Launching off the docks of historic Fishtown in downtown Leland, the Transit Company runs day trips to South Manitou, as well as overnight camping trips to both North and South Manitou, and an evening shoreline tour that takes you along the Manitou Passage to landmarks like Good Harbor Bay and Pyramid Point. Of course, the transit crew makes sure that everyone is back on dry land in time to enjoy dinner at one of Leland’s restaurants. Established in 1988, Main Street Gallery is hard to miss. No one could overlook the famous metal giraffes, lions and fish in the gallery’s front yard—all a beautifully crafted promise of the gorgeous pieces inside. Stroll through the gallery to check out paintings, glassworks, woodworks, metal, pastels, and ceramics.